One of the key features on the Healthrider H155t treadmill is the 7" flat-panel TV screen that lets you watch your favorite shows during your workouts. Want more options for entertainment? Then plug in your iPod and listen to tunes through premium speakers built in to the console. The Healthrider H155t treadmill has 35 built-in programs; you get 6 Distance Workouts (1 Mile, 5K, 5 Mile, 10K, 10 Mile, Half Marathon), 9 Aerobic Workouts, 10 Weight-Loss Workouts, and 10 Performance Workouts designed by Certified Personal Trainers. Each program automatically adjusts the speed and incline so you can focus on the workout and not the machine’s settings. UPDATE: The H155t model is no longer available. You can check out all of the new treadmills for sale at the Healthrider online store for special deals. The deck on the HealthRider H155t treadmill features SoftTrack™ Adjustable Cushioning which can be adjusted to your own comfort level. You can make the deck feel more firm or more flexible. Powering the roomy 20" x 60" belt is a large 3.5 CHP commercial-plus motor which is capable of handling users up to 350 pounds. This quiet, self-cooling motor and the 2.5" precision machines rollers have a very low noise level, which means you can hear and enjoy the entertainment system and cable-ready 7" TV built right into the console. Treadmill reviews on the Healthriders over the past two years have remarked on the many improvements the company has made to their brand. They put a number of simply amazing add-on features into these machines, such as expanding the programs to 35 workouts, 1-touch speed and incline controls for easy adjustments, 12% max incline level, 3-speed fan, lift-assist folding mechanism, and much more. 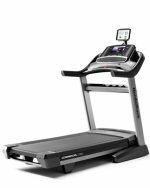 When we saw the HealthRider H155t, we did a double take – thinking the treadmill was very similar to the NordicTrack Elite 7500 TV model. They have a number of cosmetic differences as well as a few of the technical specs but otherwise they are similar. The reason for this is that Icon Fitness makes HealthRider, NordicTrack, Epic, Reebok (and other brands) at the same factory using the same components. With upgraded motors over the Horizon H140t and NordicTrack 7000 series models, and an array of programs plus audio and visual features, these treadmills are able to compete against brands that have dominated the market for the past five years. The advantage to you is that you can go with either Icon product, the NordicTrack or the HealthRider, to get the best price. Though it has an MSRP of $2,499, you can usually find the HealthRider H155t treadmill on sale for around $1,299. 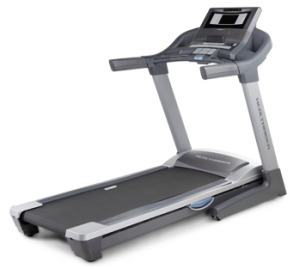 However, when it sells for $1,499, the NordicTrack Elite 7500 is a better deal: it comes with a 5 years parts and 2 years labor warranty, plus the iFit® card technology and a full marathon run workout.